Imogen's Typewriter. : Fiction Friday: Books I Read in July! This was the most I've read in a month so far this year! I'm actually pretty proud of myself! And they were all good books- with one exception. Without further ado.. I reviewed the first two of this series in my last 'Books I Read in...' post, it's my favourite graphic novel series I've ever read and the third book is no exception. It's hard to review without giving away spoilers but I will say that this volume has my favourite panel of the entire series and I've been posting up pictures on my instagram for those curious! And the addition of a play within a comic book was very Hamlet, as you would expect with a main character called Yorick. "Alas, poor Yorick. I knew him." This and volume 6 which I am currently reading contains an artist change from Pia Guerra who I love, to Goran Parlov who has a great art style but completely different. If I was going to find one problem with this series, it would be that as suddenly everyone looks very different. This volume also has one of my least favourite story lines. I love the series! But this volume is a 4 star for me. Conclusions! Don't get me wrong, the story is not finished yet but I just love conclusions in any sort of fiction. Brian K Vaughn is great at wrapping up loose ends and a lot happens in this volume to wrap some of them up. If only he could have done that with Lost... Anyway! Pia Guerra is back completely in this volume and the storyline is back to being more fun. This is a great volume 5 because it closes doors and opens new ones which is essential in a 10 volume series. Vaughn is a master of storytelling and this proves it for me. I read this in one morning when I couldn't get back to sleep and it was really fun. It was my favourite of the books so far even though not much happened in the first half. If I had gone to France on a school trip, this would be how it would have gone down and a lot of it was very reminiscent to holidays with my cousin when we were teens. Again, these books are great for nostalgia! There was 4 quotation marks missing and 1 font mistake that I picked up, just had to mention that. Robbie left! And hello, new lead singer. That's all I can really remember from this book as they concentrate more on character and humour than plot. But the humour carries it as always, I dare you to read the part where her false eyelashes stick together and she has to dance blind to the bathroom and not laugh like an idiot. In this, Georgia and Jas take a trip to America! This was a bit less relatable than the rest of the books so far. But as someone who has friends in America, I found it pretty funny reading their opinions on how different America is. It's not something you can really grasp until you look into it properly, America is not all like New York! Also, it was pretty nice to take a tiny step back from the boy obsession although I'm pretty sure spending all your money ringing random people with the same last name as the guy you like is some form of stalking..
Oh this had me laughing out loud more than once. By this point, the seventh book in the series, the characters are starting to grow up a bit more. Don't get me wrong, they're still dumb teens doing dumb teen things but they're getting to the point where you can imagine them eventually being fairly reasonable adults! 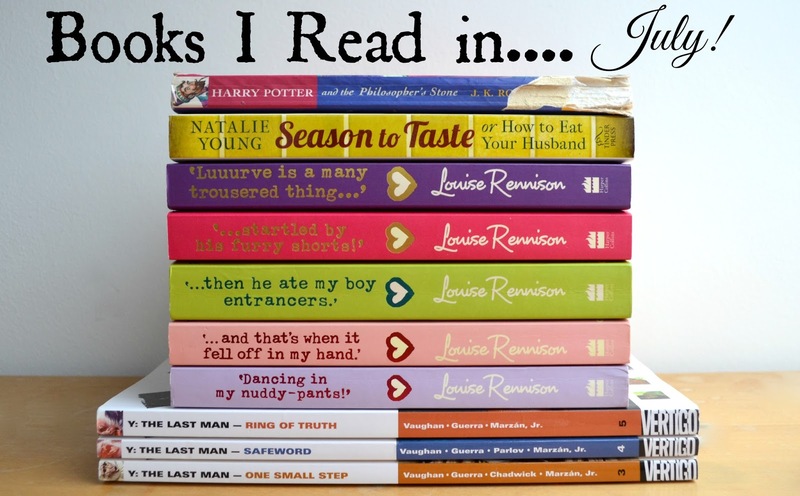 Can you tell I was on a bit of a binge reading these books? Five in one month! This was the first book where I picked it up and was 100% sure I'd never read it before so it was really nice to be reading rather than re-reading. Love triangle anyone? You've got it. Oh to be young and in kind-of-not-really-love again! What can I say about Harry Potter that hasn't already been said? This book is perfection. As an attempting children's book writer, JK Rowling is the first writer I think of when asked who my favourite author it. This book is so beautifully written, so easy to read yet so full of plot, character development, foreshadowing and just everything a book should be. It really deserves all the praise it gets. If you've not read Harry Potter in a while I urge you to pick them up again, if you've never read them then.. Get to it! And you can read what my Harry-Potter-Virgin friend thought of the book in this post! I requested a copy of this book and I was so excited about reading it. A woman who kills and eats her husband? Amazing reviews? The 'female American Psycho'? It sounded like a book I would really enjoy. We've all heard the story where the woman hits her husband over the head with a frozen leg of lamb then serves the lamb to the police man- I was expecting a book with humour, maybe a little gore and horror, and several insights into the mind of a murderer. This book didn't give me any of that. What I was present with was a very one dimensional character, with no reasoning or logic to what she did despite being described as 'pragmatic' throughout the book. I'm not the only one, Char didn't rate it much either. And it's only got a star rating of 2.79 on Goodreads. I wouldn't have kept reading if I hadn't requested it for review and I have to give it one star just because of how hard it was for me to finish. So that was my month! Have you read any of these books? What did you read this month? *I received this book from Book Bridgr in exchange for an honest review. This has clearly not changed my opinion.